On Sunday morning, it’s time for yoga church. 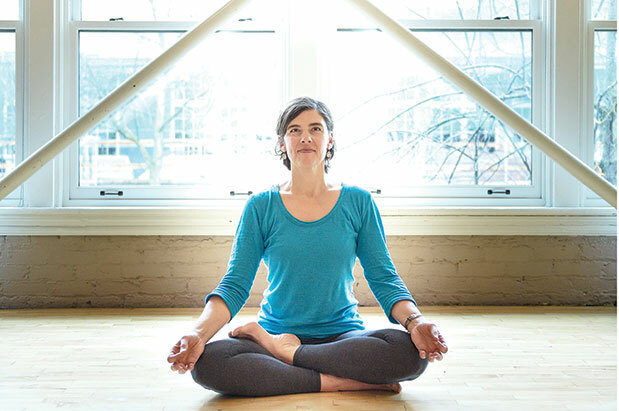 At 8 Limbs Yoga Center in West Seattle, 35–55 students attend a class called bhakti yoga, described by owner and studio director Anne Phyfe Palmer as having a “devotional, heart-centered” approach. At the studio’s flagship location on Capitol Hill, 25–40 people attend a similar class. Call it a tale of two churches: In that moment, there were more yoga students communing with a higher power on the mat than in an actual house of worship. At Christian denominations across the city, particularly Protestant sects, low church attendance is common, and indicates a downward trend in engagement with formal religion. But 8 Limbs, founded in 1996, boasts a newsletter with a distribution list of 20,000, with 3,000 readers accessing it on various devices. What does religion mean to 21st-century Seattleites? Many of us are craving connection with a higher power. But common denominators are hard to find. For some Seattleites, the draw is the charisma of a Mark Driscoll, the fallen former pastor of Seattle’s Mars Hill Church, in the megachurch of the moment. For others, it’s a church or synagogue that’s become less about a leader’s performance and more about community than congregation; more about celebration than service. Our melting-pot city is becoming increasingly diverse—in some churches, it doesn’t even matter if you believe in Jesus. And whose Jesus is it, anyway? In terms of religion, Seattleites defy categorization. “The region has been distinctive in that there has never been a dominant religious reference group,” says Patricia O’Connell Killen, who co-edited Religion and Public Life in the Pacific Northwest: The None Zone and is academic vice president at Gonzaga University. For instance, Salt Lake City has its Mormon community, so you’re either actively Mormon or you’re defining yourself as not Mormon. Our city offers variety—theological diversity—with both long-established houses of worship and up-and-coming alternatives. People who are active in religious life have lots of options, and there’s creativity here in what kind of religiousness to pursue. Want to pray at St. James? Worship the powder gods at Crystal Mountain? Flow at yoga class? It’s all available. In a parallel trend, members of the clergy are rallying to court millennials, a huge cohort that’s notoriously secular, often with a spiritual bent. The upside: Religious leaders are grappling with how to provide more relevant, engaging and participatory services and programs. That’s a bonus for people of all generations. According to the public religion research Institute, 33 percent of Seattle residents are religiously unaffiliated. For people in the field, “affiliated” refers to someone who is participating in a religious organization or institution, and doing so frequently enough for the officials of that group to count them. A 2010 study that measures religious congregations in the United States found that, among cities with more than 1 million people, Salt Lake City is the most religious, and Portland is the least. Seattle was ranked 49 out of 51. “The Pacific Northwest has always been a region which has had a relatively meager religious affiliation,” says James K. Wellman Jr., professor and chair of the comparative religion program at the University of Washington, who describes Seattle’s religious landscape as composed of “pockets” of denominations, lacking a center. In Wellman’s view, the trend of secularization is on the rise. With the tech boom, the greater Seattle region has drawn talent from around the world, particularly an influx of young professionals. “This cohort of high-tech, millennial culture is more secular than any other generation that’s come before,” says Wellman. “Between 32 and 35 percent of millennials have no interest in religion at all.” Contributing to disaffiliation are parents who don’t insist that their kids attend church, synagogue or mosque, he says. @rocknrabbidanny. TDHS is the area’s largest Jewish congregation, with campuses in Seattle and Bellevue. Weiner is keen to address the needs of young people and pre-parenthood professionals, enticing the millennial generation with creative programming designed to engage them in the time period prior to the life-cycle events that are part and parcel of life with children. At TDHS, Weiner’s colleague Rabbi Jaclyn Cohen oversees programming for “The Tribe,” a social, spiritual and educational experience for ages 22–35. On Rosh Hashana, the community celebrated its ninth annual “Appletini,” a social event in connection with the Jewish New Year (one of the signature rituals is eating apples and honey). From 2001 to 2014, Seattle’s Jewish community experienced a 70 percent increase in its numbers—as many as 63,400 Jewish residents. Weiner’s own congregation has grown considerably, a trend he attributes to both the Jewish population boom as well as growth in the Seattle area. With its success in growing its membership, Temple De Hirsch Sinai bucks some of the trends of declining affiliation and attendance seen in the Puget Sound area. A 2014 study published by the Jewish Federation of Greater Seattle highlights the challenges of retaining Jewish continuity in the community at large. Only 34 percent of the area’s Jewish households include a member of a synagogue. One-third of Jews here don’t attend religious services. Many of the threads of Weiner’s plan echo elements of alternative faith communities, which are creating diverse options for engagement, whether through prayer, cultural connections with their heritage or spirituality. The Kavana Cooperative is an “emergent” Jewish community that was created by tech professional Suzi LeVine and Rabbi Rachel Nussbaum, who envisioned a “pluralistic, nondenominational, cooperative Jewish community” outside the typical synagogue paradigm. Smith appreciates being part of a ministry that offers the kind of camaraderie with which people enter the room and greet one another with hugs, wash the dishes from potlucks together, and grapple with how to resolve issues of social and economic injustice. Rather than a top-down experience from a sterile lectern, the fellowship’s Sunday-afternoon “Celebration” service is highly participatory and sensory. Instead of priest-only leadership, “co-creators”—a dozen or more community members—share and lead a variety of thoughts and prayers. The choir, accompanied by instruments, sets an uplifting tone with folk and gospel tunes. The aroma was homey during the warm, welcoming service: Chocolate chip cookies for the “love feast” potluck were baking in the oven. But in providing a New Age–style vibe, the Reverend John Helmiere, a Yale Divinity School grad, backs this style with substance. He is an activist priest who walks the talk on social change. In 2011, when Valley & Mountain began, he launched an annual Lenten season campaign to protest economic injustice. In 2015, the effort focused on mass incarceration and racial inequality in the King County Juvenile Division’s detention system. Valley & Mountain has about 100 individuals who are involved on a regular basis, and it’s adding a second Sunday service to accommodate its growth. Helmiere doesn’t think of expansion in terms of affiliation per se; he sees growth as qualitative, not quantitative: He’d like to inspire other communities to grow in ways that are germane to their own neighborhoods. In its beginnings, Valley & Mountain received seed money from the United Methodist Church (UMC). The Methodist denomination has 54 churches and approximately 7,000 members in its Seattle district. Methodists have been in Seattle for about 150 years, says the Reverend Rich Lang, the UMC’s Seattle district superintendent, who has acted as a mentor to Helmiere. Lang says that Valley & Mountain’s success contrasts with other urban Methodist churches, where only 15–75 people might show up on Sunday. The numbers are better in the suburbs, which might have 150–300 members, but those churches still lack the vitality he sees at Valley & Mountain. The Methodist movement is more established, Lang says, but its roots may have hindered growth. “The decline had to do with the cultural changes of the ’60s and families who went to the evangelical churches, which were able to adapt to the changing culture more rapidly,” he says. It’s ironic—and intriguing—that until recently, Seattle was known as an epicenter for megachurches. Killen of Gonzaga University says that research suggests that megachurches are no longer on the rise. But for a time, in the Seattle area, they were red hot. Seattle was home to one of the nation’s largest and most influential megachurches, Mars Hill, which, by many accounts, imploded after cofounder Mark Driscoll was accused of plagiarism, bullying, misogyny and brash communication. Mars Hill was founded in 1996, and at the time of its downfall in March 2014, had grown to an estimated 14,000 members across five states and 15 locations. Those locations offered coffee shops and free Wi-Fi, and if they couldn’t come to see Driscoll in person, followers could watch him on the big screen. With Driscoll as the public persona of Mars Hill, church became cool. He resembled an indie rocker: sporting a hoodie, ripped jeans and a certain swagger. The faithful came to the church turned warehouse in their own hoodies and ripped jeans. Before Mars Hill, many said, they had never affiliated with organized religion. But, “that’s the ethos of Seattle,” Wellman says. “Religion has a tough time staying.” In the case of Driscoll, Wellman says, Mars Hill “popped up with his charismatic personality, and then died.” On one hand, entrepreneurs like Driscoll can do well here, exploding onto the scene and succeeding. On the other hand, there’s our city’s Nordstrom-esque culture of returning previously worn items. Yet, these days, many view yoga as a bridge to spirituality, one that offers infinite layers and interpretations. It is one option among many on Seattle’s religious-to-spiritual continuum, our city’s myriad-piece puzzle of places where we can contemplate our path and purpose. And for Seattleites who are seeking to commune with a greater power, whether it’s in a church, synagogue or mosque, in the cathedral of the great outdoors or on a sticky mat, finding that higher ground could be right beneath their feet.